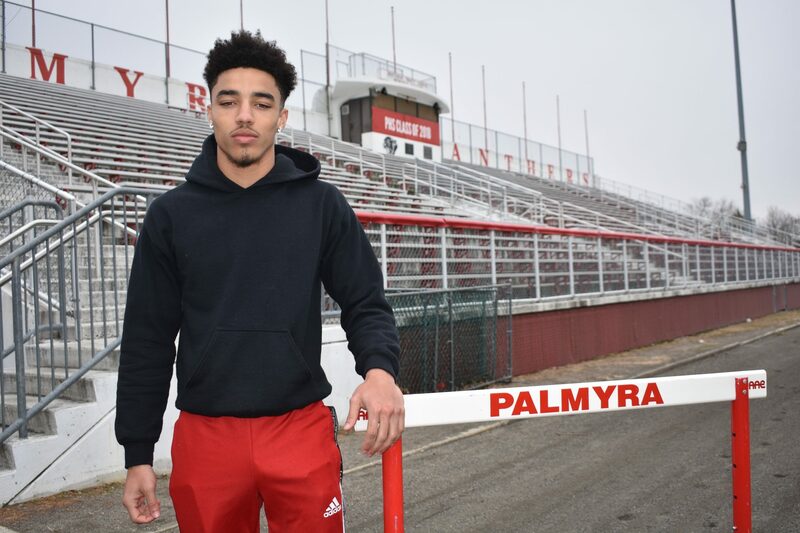 Five months after setting a new South Jersey record on the gridiron, Aviles is primed to add to his state title medal collection in his final high school track season. Wherever Palmyra High School senior Sam Aviles winds up in September, he’s going to have a new coach who will feel like a kid on Christmas morning. Aviles is among the many gifted prep athletes in New Jersey. But he brings the gift of an athletic trait that simply can’t be taught or coached: speed. The 5-9, 155-pound Aviles can run with the best kids in the state, whether it’s on the gridiron on a brisk Friday night or hopping over hurdles in a track meet. Chew on this: Aviles set a South Jersey record for the most rushing yards in a single game this fall, sandwiched between collecting Group 1 state championships in spring track (110-meter high hurdles) and winter track (55-meter high hurdles) in the last 10 months. 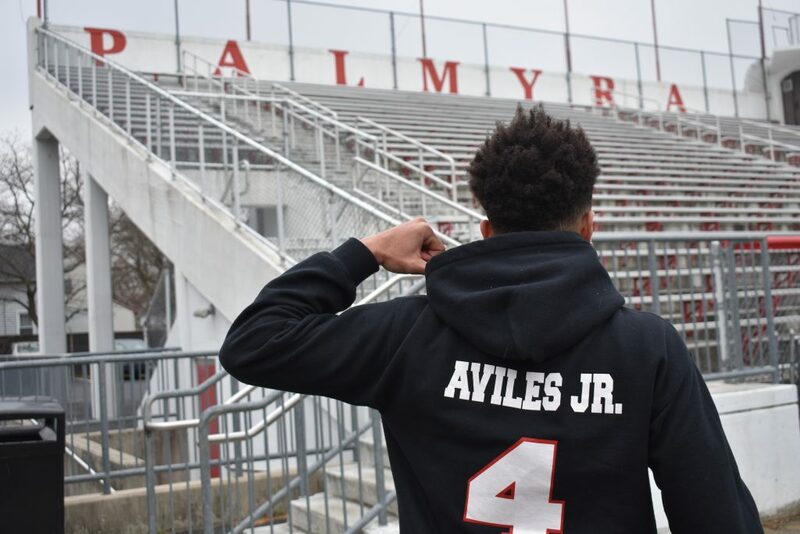 Aviles entered his final spring season at Palmyra unsure of whether it’ll be football or track he continues in college, which seems like a good problem to have for an 18-year-old. The Sun: So I was looking at your rushing record (404 yards in a 41-32 win over Bordentown in October) and decided to do some research. According to MaxPreps.com, this one guy from Netcong, N.J. (John Giannantonio) once ran for 754 yards in a game. The Sun: And that’s like 1950, so, whatever. In modern times, this other guy (Journey Brown, Meadville, Pa.) in Pennsylvania ran for 722 yards in 2015, which is still nuts. Anyway, did I hear it right that you would have had a couple hundred more yards in that game if it wasn’t for a couple of penalties? Aviles: Yeah, I would have had like another 200. The Sun: What was going on in that game, how do you describe things opening up for you like that? Aviles: When I got the ball, I looked up and there was a hole, and I was just running. I didn’t expect to run that many yards and I didn’t expect to score that many touchdowns either, it was crazy. I’ve never been more tired in my whole life. Aviles: I was winded after that. The Sun: When did you feel it the most, the next day? Aviles: I felt it right after, I was on the bus home and half asleep. I could barely keep my eyes open. I slept really well that night. The Sun: I imagine you slept in a little? Aviles: Yeah, when I woke up I saw everything on Twitter, my notifications and stuff. I didn’t know that I ran for that many yards. The Sun: And it could have been 600 yards (which would be a top-10 national record). So what prevented those extra 200 yards, holding penalties? Aviles: Yeah, there was holding, a lineman downfield, different things. Sam Aviles had 404 rushing yards on 11 carries for Palmyra in the 41-32 win over Bordentown. TD runs of 99, 83, 62 and 44. The Sun: Is it safe to say that football might not even be your top sport? Aviles: Yeah [laughs], it’s safe to say that. I mean, I run track, too and that’s really what I’m doing now. The Sun: What are your goals this spring track season? Aviles: Well, to beat all of my personal records. My last season was kind of shaky. I was a state champ last spring, but I was coming off injuries and stuff like that, so I feel like I didn’t run my best. This year, I want to run as best as I can. The goal, to be honest, is to beat the school record (13.8… his best is 14.7). But I’ve definitely got faster, so. The Sun: How do you get faster? Training? Aviles: Yeah, it’s basically about training. What they have us do at practice, it helps us train toward gaining speed. The Sun: When did track and field become serious for you, freshman year? Aviles: Nah, freshman year I did outdoors. I hurdled, but I didn’t think I’d be good. Sophomore year is when I realized I could set the tone and be the next big hurdler, so, ever since then I’ve been taking it seriously. The Sun: That’s funny, because I’ve talked with (Deptford’s) Naseem Smith and he said the same, that he didn’t begin until sophomore year and then it just took off. Aviles: Yeah, it was crazy. Because in sophomore year I was second in the Group State Championships and I should have been first, I hit a hurdle. And that spring I got hurt and didn’t hurdle, but when I did hurdle my times were horrible. That was a time when I was second-guessing track because I’m like, am I even going to bounce back? And I was able to bounce back and get better, too. The Sun: So when do you have to decide on college? Aviles: Probably in the next month. The Sun: Is that fun, stressful, or both? Aviles: It’s both, to be honest. It’s both. The Sun: Do you have a preference whether you want to stay local or go away? Aviles: I mean I don’t have a strong preference but I’d like to stay local. I have a little sister, she’s still small. And I have other sisters and brothers. The Sun: I was going to ask – anyone else in your family an athlete? Aviles: Yeah, I have a few cousins. I have one younger cousin that runs in PA. She’s only in eighth grade but running high school times. Taleea Buxton. The Sun: Let’s mix it up. if you’re lining up there right now for a race, who do you want to see lined up against you? Aviles: The top athletes in the state. I feel like I can run with anybody, so why not run with the best? It’s going to make me better. The Sun: If you could build your only relay team, what three guys are you putting on your team? Aviles: [Smiles]. Me. Naseem from Deptford. Sincere (Rhea) of St. Augustine and fourth one, probably Jayaire King from Willingboro, they call him JaJa. The Sun: What’s your favorite thing to do outside of sports, when you’re not running track or playing football? Aviles: I watch Rap Battles. I’m real big on that. The Sun: That’s cool. Do you have role models, anyone you look up to whether it’s in sports or outside of sports? Aviles: I have a few, in every aspect of my life I have somebody. But as far as hurdling, the person I will sit there and watch it probably Grant Holloway. He’s at the University of Florida. He’s been shaking up the world lately. The Sun: If they were to make a movie of your senior year of high school, who should they cast to play you? The Sun: Oh yeah? You have some acting skills? Aviles: Yeah [laughs]. But yeah, I don’t even know to be honest. The Sun: That’s cool. I know both Babe Ruth and Jackie Robinson played themselves in movies. That’s going back though. Do you have a TV show or movie you’re into? Aviles: My favorite TV show is “Martin.” I have every episode on tape. The Sun: Oh nice, that’s a classic. The Sun: Oh, “Belly,” I know that, it’s kind of old, right? Aviles: Yeah, a while back (1998) but it’s pretty cool. Aviles: It’d have to be history. Aviles: I have a few. I’m real cool with my teachers, but Mr. (Thomas) Sheel. The Sun: Last one – if we’re at the Meet of Champions and you’re walking out to get your first-place medal, what song do you want playing, as your walk-out music? Aviles: Definitely a Meek Mill song. That’s a hard one. [Laughs]. Probably “Going Bad,” with Drake in it, that’s the one. I’ve been listening to that a lot lately.